Arcturian Ascension Tools: Who was Padmasambhava? Padmasambhava, also known as Guru Rinpoche, was an Indian tantric master who played a major role in bringing Vajrayana Buddhism to Tibet in the eighth century. The subject of many myths and legends, little is known about him historically. 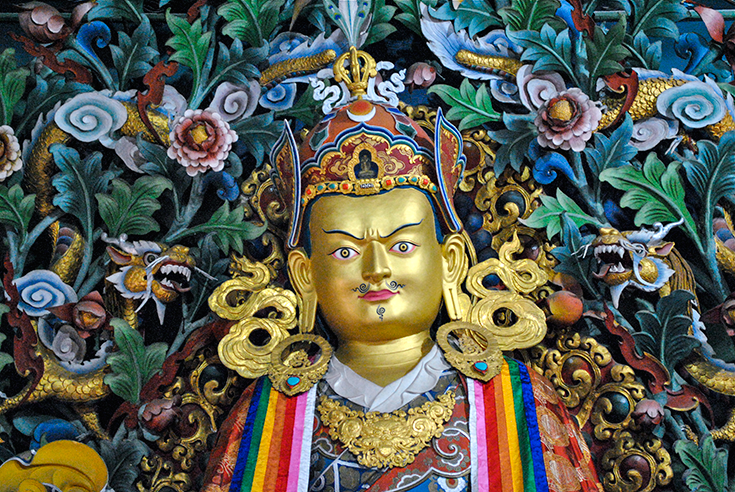 During the reign of King Trisong Detsen, Padmasambhava helped establish the country’s first Buddhist monastery in Samye and he is considered the founder of the Nyingma (“ancient”) school, the oldest of the four major traditions of Tibetan Buddhism. In addition to his historical role, Padmasambhava is an important symbol of enlightenment in the Dzogchen teachings of the Nyingma lineage, and his image is often visualized as an object of meditation. He is said to have had eight manifestations, including both the peaceful and wrathful forms. For example, he rides on a pregnant tigress in the fierce form of Dorje Drolo, which he assumed to bring the local deities and guardians of Bhutan under his control. Padmasambhava is closely associated with the terma tradition of the Nyingma school, in which specially empowered lineage holders called tertons discover secret teachings or texts. Many of these texts are attributed to Padmasambhava himself, who is said to have hidden them in the physical world or in the mind-stream of tertons. Padmasambhava’s main consort was Yeshe Tsogyal, another semi-legendary figure who was an important realized teacher in her own right. She received Dzogchen teachings directly from Padmasambhava and a number of important texts are attributed to her.